The Willows is a long-established Honolulu restaurant. It's a private, tranquil place in the middle of apartments near Kapiolani and University. 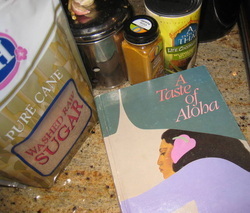 I found the recipe for Willows shrimp curry in A Taste of Aloha, an out-of-print cookbook put together by the Honolulu Junior League in 1983. The original recipe was a little dated and a little heavy. A half-gallon of coconut milk heavy. Changes were definitely in order. I used chicken and it took about an hour. If you use shrimp, it would probably take about 40 minutes. It's also important to chop the garlic, onion and ginger very finely so that the sauce is as smooth as you can get it. Cut chicken into bite-size pieces, or shell and de-vein shrimp. Mix wine, canola oil and curry powder in a mixing bowl and dump the chicken (shrimp) in and let it marinate while the sauce is made. Open the can of coconut milk so you can easily add it later. Melt butter in a medium-sized sauce pot. Add garlic, ginger and onion and cook until the onion is soft, but do not let it caramelize. Whisk in sugar, salt, curry powder and flour. Whisk in coconut milk a little at a time so that the sauce stays smooth. Keep whisking and cook for about 20 minutes on a low boil so that the sauce gets thick. Turn it off and let it sit there. Spoon a little bit of the marinade into a large medium-hot pan. It should sizzle a bit. Add chicken and cook until the pieces are no longer pink. Pour in the curry sauce and mix to combine. Bring to a gentle boil. Add pinches of salt to taste. Serve over hot rice with the accessories of your choice.